Should Eating Disordered Patients Know Their Weight? Doctors weigh their patients. Patients own their charts. 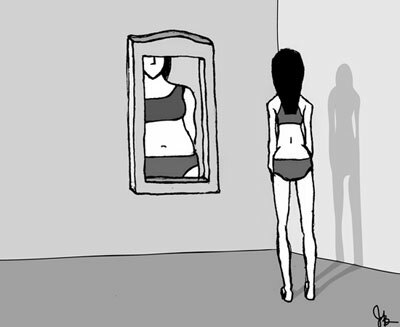 For some sensitive people, knowing their weight is a trigger to disordered eating. As such, should doctors not weigh patients who could be prompted to re-start their disorder, or should doctors make a point of weighing eating disordered patients as a way of desensitizing them about weight? Once again, there is no answer, only strongly held beliefs which get promoted by “experts”. My opinion: the doctor should obtain consent for weighing the patient so that the patient can take control of his or her mental health. Blood tests, although certainly more expensive than weight checks, can give health information and so obtaining weight is not critical to medical care for these patients. On the other hand, eating disordered patients do need to heal and accept themselves and that includes accepting their weight. However, in the course of the illness, patients may be too sensitive to deal with their weight and so it might make more sense to avoid that trigger, if possible. Should the psychotherapist inform the primary care doctor about whether to weigh the patient? Maybe, but I would prefer that the therapist work with the patient directly so that the patient can inform the physician about whether it makes sense to be weighed. After all, eating disorders are so often about control, returning control to the patient, in big ways and in small ways, is a major step of healing the disorder, in that the more control the patient has in his life, the less important it is to control eating. Like all self-abusive behaviors, we have no clear path of intervention. We have to use our best guess. That is the state of the art. Big data does not help us here. I can live with that.